You don't have to look far to find Mr. Claus this Christmas. Thanks to the folks at Google and NORAD, you can track Santa online right from your computer or cell phone. • In Google Earth: Download the NORAD Tracks Santa add-on for Google Earth (available starting December 24), then follow Santa's adventures in 3D within the program. 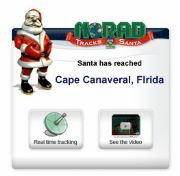 • On iGoogle: Add the NORAD Tracks Santa gadget to your iGoogle homepage. You'll get a box with Santa's latest location and links to videos and maps right on your start page. • On your phone: Install Google Maps for Mobile on your cell phone, then search for "norad santa" within the program to get instant updates on Santa's progress. • On Twitter: Add @noradsanta to your Twitter friends to keep up via tweet. "Bitz the Elf" will stay in touch once you're connected. If you just can't wait to get started, there are some countdown games and activities for kids on the official NORAD site here. And you can check out some highlights from his 2007 journey in the video below.